The Campaigns of Oliver Cromwell during the English Civil War: 1642- 1649, was written by Captain P. A. Charrier in 1906. Charrier, a veteran of the Second Boer War 1899 – 1902, was a Captain of the Royal Munster Fusiliers Regiment of the British Army. Charrier’s objective for this book is to place Oliver Cromwell’s military achievements on the same level as other great conflicts. 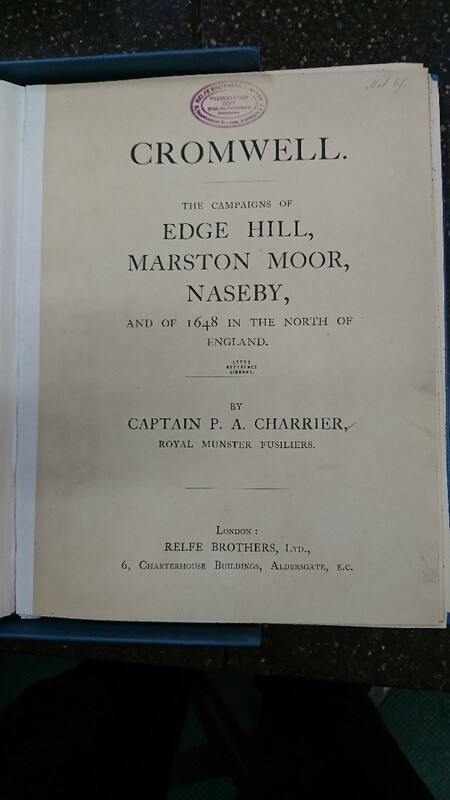 To do this, Charrier analyses three battles from the English Civil War, intentionally including two decisive Parliamentarian and Cromwell victories, Marston Moor and Naseby. One of the most exciting and unexpected parts of Charrier’s work was his decision to hand draw battle plans to explain every aspect of the battles, including how the armies setup, the initial confrontations, a decisive manoeuvre and then the explanation of why one side was victorious. The accompanying book is designed to illustrate the battle plans by explaining the tactical genius of Oliver Cromwell; however, the book at all points returns the reader to the battle plans, as they are the key part of Charrier’s narrative. 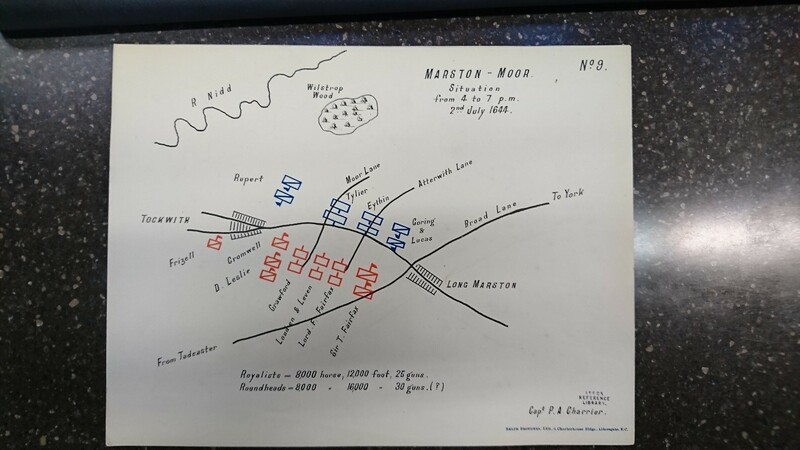 These battle plans are an unusual way of explaining very complicated tactical military decisions and movements in a clear and illustrative way. Charrier’s personal style of writing leads him to often compare the British Army in 1906 to the Parliamentarian Army under Cromwell in the 1640’s. Charrier concludes that the British Army of 1906 was incapable of killing 5000 soldiers in three hours as happened at Marston Moor in 1644. Charrier attributes this to the lack of military personnel, misuse of weaponry and lack of will from the British soldiers in 1906. Charrier’s assertions are made heart-breaking by his own death at the Battle of Etreux at the beginning of the First World War in 1914, where Charrier and his entire regiment was routed by a German offensive. Charrier’s personal style of writing and his willingness to compare Cromwell’s campaigns to the pre-First World War British Army leads to a very interesting and unintentional intersection of the two timelines, leaving the tragic impression that even high ranking military commanders, such as Charrier, were unprepared for the devastation that the Total War of the First World War would cause.